The Great Smoky Mountains are a major mountain range in the southern part of the Appalachian Mountains, the second ridge line forming a north-south running mountain chain from the Eastern United States and bordering the western side of the Blue Ridge Mountains. Also called the Smoky Mountains or the Smokies, they straddle the border between Tennessee and North Carolina, and are entirely west of the Eastern Continental Divide. 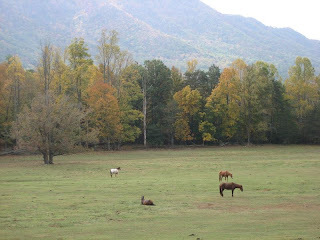 We went to Smokies to see the much talked about fall colours this season, and I must say it was well worth the visit. We even got to take a ride in a helicopter to get a better view of the top of the mountains. We also went on the Sky Lift. 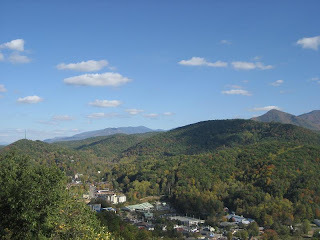 The city of Gatlinburg is a fascinating one with a street lined with shops, attractions and various other things to do. There is one section called “The Village” which has quaint shops and beautiful fountains. The whole city of course was geared up for Halloween. There was a Candy making shop where we saw how Taffy is made and how its wrapped too. The best place was a shop called “Sleepy’s”, tucked away in a small corner of Gatlinburg, which had a giant sleeping/rocking chair in front of the store. Inside the store were all sorts of trinkets and very funny signboards. I bought the third one for my kitchen...hehe! The scenic ride up into the mountains was a feast to the eyes. It seems you had such a wonderful holiday. gr8 location & wonderful pics. u look gorgeous!! Thanks Sreelu :) You really should go sometime, its worth it..
Oh wow Mocha, that's awesome! I'm glad this brought back good memories for you:) thanks for stopping by! Thanks Rajitha:) You really should go before it gets too cold,its wonderful now. 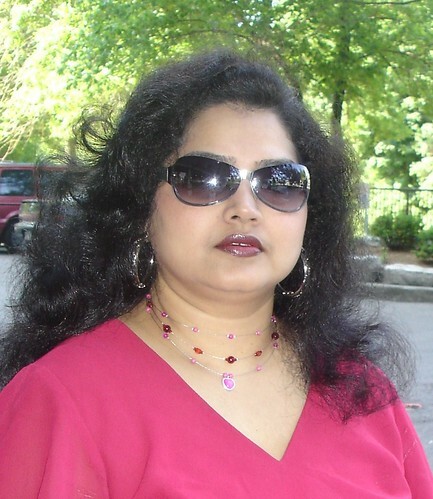 Thanks Asha dear, I'm glad you guys enjoyed in Gatlinburg too:) Dollywood was all over the place..hehe! Someof those pics are breathtakingly beautiful. You guys make a cute couple:-)I had pictured u differently in my head.